In the face of life-threatening news, how does our view of life change—and what do we do it transform it? Remaking a Life uses the HIV/AIDS epidemic as a lens to understand how women generate radical improvements in their social well being in the face of social stigma and economic disadvantage. 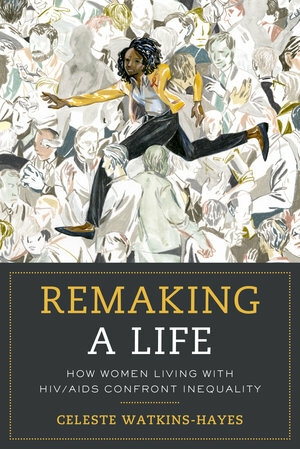 Drawing on interviews with nationally recognized AIDS activists as well as over one hundred Chicago-based women living with HIV/AIDS, Celeste Watkins-Hayes takes readers on an uplifting journey through women’s transformative projects, a multidimensional process in which women shift their approach to their physical, social, economic, and political survival, thereby changing their viewpoint of “dying from” AIDS to “living with” it. With an eye towards improving the lives of women, Remaking a Life provides techniques to encourage private, nonprofit, and government agencies to successfully collaborate, and shares policy ideas with the hope of alleviating the injuries of inequality faced by those living with HIV/AIDS everyday. Celeste Watkins-Hayes is Professor of Sociology and African American Studies, and Faculty Fellow at the Institute for Policy Research at Northwestern University. She is also the author of The New Welfare Bureaucrats: Entanglements of Race, Class, and Policy Reform.